Eastnor Castle - Golden Gates Lodge01531 633160work Self-cateringOn Eastnor Castle Estate we have two holiday cottages located in the Eastnor Deer Park in the foothills of the Malverns, Herefordshire. Both are finished to a high standard and rated 4* by Visit England, and situated in an Area of Outstanding Natural Beauty a few miles outside of Ledbury with easy access to footpaths and countryside. 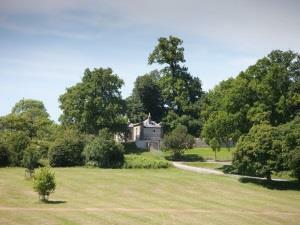 Both Eastnor Castle Estate Cottages are dog friendly. Peacock Villa sleeps up to 6 people and Golden Gales Lodge upto 4 people. Eastnor is the perfect holiday retreat, giving visitors easy access to the surrounding countryside with miles of unspoilt walks and cycle ways. On Eastnor Castle Estate we have two holiday cottages located in the Eastnor Deer Park in the foothills of the Malverns, Herefordshire. Both are finished to a high standard and rated 4* by Visit England, and situated in an Area of Outstanding Natural Beauty a few miles outside of Ledbury with easy access to footpaths and countryside. Golden Gates Lodge provides single level accommodation for up to 4 guests and comprises of two listed buildings separated by a black and gold wrought iron gate. The large Lodge comprises sitting room, kitchen, double bedroom with en-suite bathroom and the smaller lodge has a double bedroom and bathroom. Directions from London: Take M4 west. Exit at Junction 15 (Swindon) and follow the A419/A417 to Cirencester and Gloucester (dual carriageway). Before Gloucester leave the A417 onto the M5 North (towards Birmingham) at Junction 11A and continue as if from north or south below. Directions from north or south: Exit M5 at junction 8 onto M50. Exit the M50 at Junction 2 and follow A417 to Ledbury. Follow the brown tourist signs to Eastnor Castle via bypass and through Ledbury Town Centre onto A449 (signed Worcester and Malvern). After 1 mile, turn right again onto A438 (signed Tewkesbury and Eastnor). The entrance to the Castle is after 1 mile on rt. hand side.